Was there a moment you realized you wanted to pursue your career as an artist? I can’t pin point any major event in my life that sparked a serious movement into the arts; it was never that black and white. Art, no art— It was omnipresent. As an important and therapeutic aspect of growing up and into myself, the natural progression was to focus on my art as work. It’s the only thing remaining from my childhood that I’ve cared for enough to help it transcend long periods of time and carry it into my present, and hopefully future. It’s become more than a literal representation of my eyesight.Each painting brings new explorations of the images and their relationships to each other. Can you talk about the correlation between your eyesight and your double exposure series? My reality found its way into paintings. Double vision is one of many symptoms of a congenital eye disease I have, called strabismus. The initial concept behind my merge images was born out of, and relied heavily on, those symptoms. But the more work I produce the more the ideas begin to develop into something more complex.It’s become more than a literal representation of my eyesight.Each painting brings new explorations of the images and their relationships to each other. Where do you find images? What inspires you to paint these certain subjects? An artistic nature can be stimulated by anything. So I gather my images from multiple sources, friends, strangers, my own photos, and Google. I’ve used the photos of talented individuals such as Tamara Lichtenstein, Tanya Prilukova, and Marija Stranjnic. I’ve used my dear friends Alex Welsh and Jeff Enlow to shoot my own models, and myself, multiple times. There’s always an undercurrent of anonymity with my portraits. I like to keep subjects vague so they can stay universal. Do you take from your life to create your work? What do your pieces say about you or what you’re experiencing? Absolutely. I pull from my past and present. Every artist attempts to make sense of their surroundings through their work. Speaking strictly aesthetically, they are simply a representation of how I see. What are you trying to get across to the viewer in your work? Besides beauty for beauty’s sake, I hope for my viewers take away the exploration of time as something non-linear, everything happening all the time. 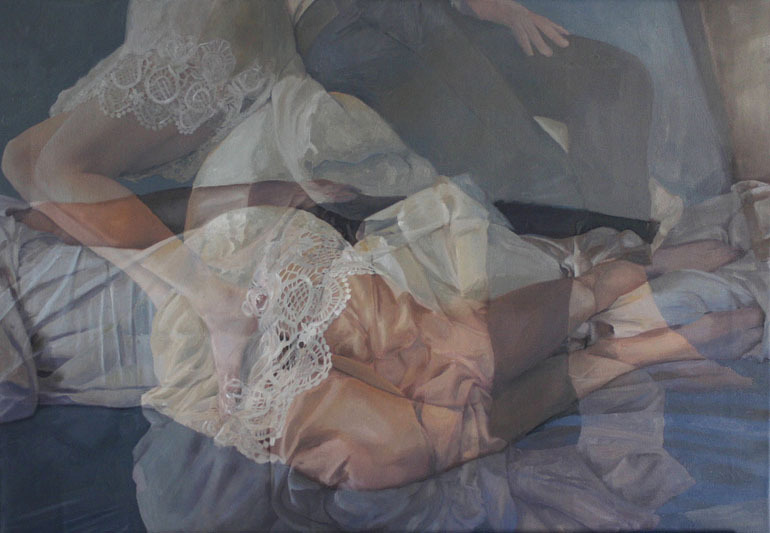 A moment is not just one singular image and my paintings are my attempt to freeze a moment or feeling into several images compounding on one another, like memories resting on a shelf. The viewer’s own experiences and emotions will reflect how they unpack my paintings. Mediums you generally work with? Eternally devoted to oil and the occasional acrylic. Canvas. Hair (real and fake). Starting to get more into film photography, so I’m able to take my own in-camera double exposures. I like the uncontrolled element of taking my own photos. Normally I build the images I use in Photoshop, so it’s very foreign and liberating for me to relinquish that control. A moment is not just one singular image and my paintings are my attempt to freeze a moment or feeling into several images compounding on one another, like memories resting on a shelf. Where do technology and your art collide? Everywhere. I’m addicted to using technology in conjunction with one of the oldest forms of human expression. 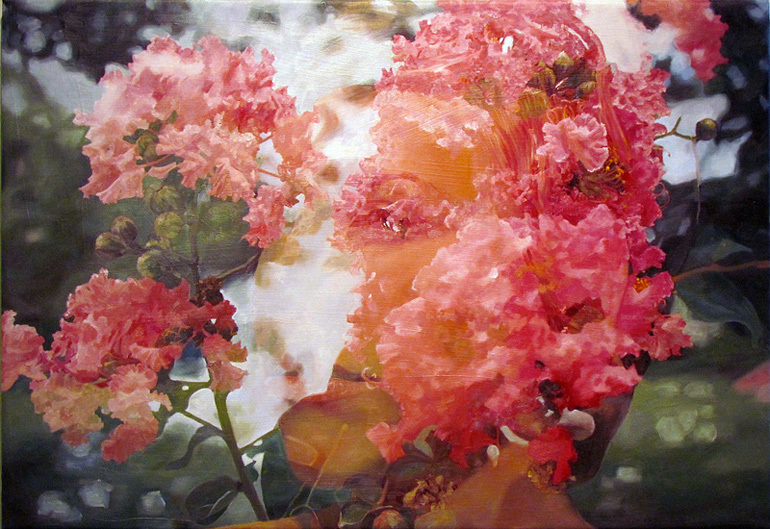 I take digital photos, I correct and assemble double exposure images on Photoshop. As much as I love the integration of technology, I’d never abandon my affection for the hand-crafted. Something that requires patience, viewer engagement and has the potential to last long-term is always more precious. 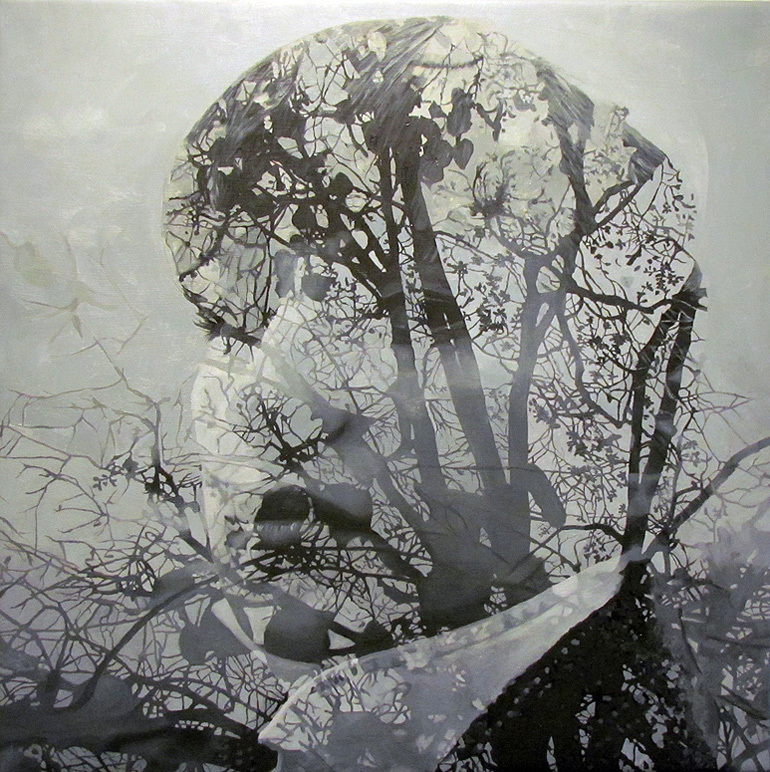 What other works do you like to create aside from your double exposure paintings? Drawing, particularly meticulous line drawings. Installation involving multiples and perspective. Pinning hair to my bedroom wall. And very recently, a trendy dive into terrarium making. I love the small environments and the layers of terrariums. They’re so tender. Who or what are some of your influences? Art related, or not. Currently— hanging plants, HAIR, Robert Mapplethorpe and Patti Smith’s relationship, Brooklyn in the near future! Always— Gottfried Helnwein, my poor eyesight, hair, Gerhard Richter. What direction are you going? 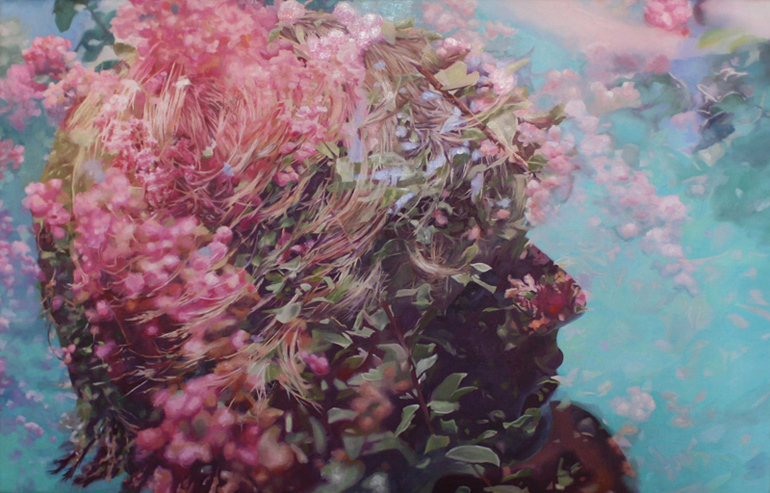 Will you explore deeper into photorealism or branch out into other works? I’m hoping to branch out into a few other disciplines but nothing too far from the realistically painted path.But there’s a definite need to rummage further into the conceptual side of my work— ideas are always craving cultivation. The investigation of my psychology and survey of my fears is an important step to lay the groundwork for more concept heavy work. Dealing with the fears involving what I make, the way I connect with people, my distortion of reality and memory, and capturing my history to turn it into something universal while still adhering to my identity. …ideas are always craving cultivation. Moving to New York. Some paintings for the Affordable Art Fair in Los Angeles, (January 18th to 22nd, 2012!). Formulating my own fonts. Fixing or replacing all my loose and lost buttons on my clothing. A couple intricate drawings of hair.Concepts/blueprints for some installations. A little bit of photography. Perfecting the architecture of the ultimate bedroom blanket fort.